The best fishing kayak is going to help you enjoy a favorite beverage, let you fish at your leisure, but still keep you safe on the water. Those folks with their big old boats don’t know what they’re missing if they’ve never been fishing in a kayak! If you’re ready to have the ultimate kayak fishing experience, then the Salty Dog’s guide to the best fishing kayak is what you need. Already know everything you need to know about fishing kayaks? Then use this chart below to find some of my favorite kayaks that are available right now. What Should the Best Fishing Kayak Have? What is the best fishing kayak? It’s the one that will let you bring in the fish that you catch while it keeps you safe on the water. That’s right – the #1 thing that you need to have with your fishing kayak is a place to put a caution flag. When you’re out their fishing, right on the surface of the water, many boaters aren’t going to see you. Doesn’t matter if you’re in the ocean or on a river or if your kayak is bright orange. A caution flag will give you more visibility and you need a place for it. You’ll also want a place in your fishing kayak for your rods. Some of them have just one forward facing rod holder, but the best kayaks for fishing have a spare holder that sits behind you. Don’t make the mistake of using the holder for fishing, however, because you’ll find yourself having a river water cocktail if you manage to hook something! Set your primary rod, and then use the spare rod for a hands-on approach. If you love the fancy gadgets for fishing, then there should be a place for you to put your equipment. Here’s a Salty Dog secret: you can tell where the fish are biting because of the bubbles in the water. That’s right – bubble water is the evidence of fish that are hungry for the best bait you can bring them. Use an electronic fish finder and you’ll see that where there are fish, there are bubbles around you kayak. What Is the Advantage of the Best Fishing Kayak? 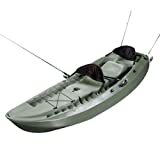 It’s a question I’m asked all the time: “Salty Dog, why can’t I fish from my regular kayak?” That’s like saying, “Why don’t you need to have chocolate on a candy bar?” The best fishing kayak, whether it’s for the river, the lake, or the ocean, has a place to store all of your gear. You can lock your paddle into a retainer bracket so it’s out of your way. You’ll have the ability to troll for fish if you want. You’ll have a dry storage well up front. These are all things that you’ll need to have a successful fishing experience from a kayak. When you’re trying to reel one in and you’ve got a paddle clanking around next to you and you’re smacking your head against all the coolers that you brought along, there’s a good chance you’ll lose that fish. Trust me on this: the advantage of the best fishing kayak is its design. You can bring as many tools as you need to have a great day out on the water. The best fishing kayak for the money is also going to have one more unique feature: adjustable foot rests. The Salty Dog doesn’t want this foot rests for comfort, mind you. It’s all about leverage and control. When you’re seating in a confined fishing kayak, you need your feet to add leverage to your rod. The adjustable footrests let you do just that. Is the Best Canoe for Fishing Better Than a Kayak? Is a paddleboat better for boating than a speedboat? A canoe is more for those moments when you and your buddies want to hit the water to do some fishing. You throw a cooler in the middle, a few of your favorite drinks, and you don’t really care if you catch anything. Although the best tandem fishing kayak can help get a buddy out on the water with you, most kayaks are going to be a single person experience and that’s the way you want it to be. When there are a lot of people around, the fish aren’t around. It’s a Salty Dog rule. If you go fly fishing, then you go where no one else happens to be to get a bite. If you sit in the best fly fishing kayak, you paddle out where no one else will be. If you just want to drink with your buddies, you can do that in a restaurant and order some chicken wings. This equipment is for those who want to fish and do it the right way. What Are the Prices on the Best Fishing Kayaks Today? You’d better bring a little cash with you if you want the very best. Entry level fishing kayaks are going to cost you at least $450 right now if you shop for them online at a store like Amazon. These kayaks can get the job done, but they aren’t as comfortable or convenient as some of the more expensive options. If you’ve got a wad of cash burning through your pocket, then the best fishing kayaks can cost upwards of $6,000 – depending on the season, of course. 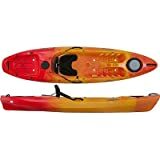 Most folks who want to do 3-4 days of fishing per month will find that a fishing kayak which costs around $2,500 is going fit their needs quite nicely. This little kayak is for those moments when you have the bug to get fishing and you don’t have a lot of time to do it. It will support up to three people out on the water, but unless you’ve got super skinny friends, maybe a tandem setup is better. There’s a dry storage compartment, ditty trays, and shock cord included so you can store your spare items. It’s a 10 footer, has room for a couple of rods, and will let you enjoy some water recreation if you’re on a pretty tight budget. The hull of this kayak is what really stands out, especially since it’s priced less than $500. It’s efficient and stable, made from polyethylene, and there’s enough room in there that you’re going to be able to fish with ease. The seat is flexible and won’t make your back hurt and everything is molded into place so it is part of the boat. There’s a back storage area that isn’t covered, but it does have a trolley system included within the design. It’s basic, but it will get you fishing. This little beauty is less than 10 feet long, but it’s one of the best fishing kayaks because of its design. Sure – the open cockpit is nice. It’s large enough to move around without causing instability. What pushes the design of this kayak over the top is that you’ve got a third swivel rod holder that can be used as you’re out fishing. This lets you feasibly take three rods out so you can maximize your experience. Make sure you have a way to warn others about where you are, however, because this kayak does tend to sit a little low in the water. This kayak is for the folks who don’t really have a good way to transport a kayak because they drive something like a Prius. 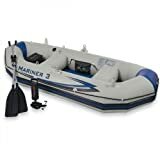 This inflatable kayak still has enough storage space for you to go fishing, but it folds down nicely for easy transportation and shipping. The sides of the inflatable hull are reinforced with aluminum plating so that you’ll still have some strength out on the water. This isn’t going to be the right kayak for a high wave environment, but for a still day out on the lake? Perfect. I really love the rudder system in this kayak. Instead of needing your paddles to turn your craft around as you’re working the rods, you can just use this rudder on this 12 footer to get where you need to go. The cockpit is molded into the frame and set down into the kayak for greater stability. Not sure about the 5 rod holders, because imagine what would happen if you caught something on all 5 lines at once! There is a nice cup holder included, however, so if you do need to work 5 lines simultaneously, you’ll be able to have some liquid courage helping you out. Many of the best fishing kayaks are thin and narrow because it helps them to track pretty easily out in the water. This kayak, however, is a lot wider than you’d expect and that accommodates more body types that want to enjoy a little water recreation on the weekend. You’ll need to work on your paddling techniques to steer this kayak straight, but it is weighty enough that it can handle a little chop if the winds pick up on you unexpectedly. I love me some adjustable foot braces and this beautiful fishing kayak has got what it takes to keep a Salty Dog happy. There are two flush mount rod holders and a swivel holder as well included with the open cockpit design. The portable accessory carrier is nice because you can use it as a tow behind if you wish. You’ll need to balance yourself well in this craft, however, because it is prone to tipping. If you’ve never used a fishing kayak before, then you might struggle with this one. If you’re a pro who is looking for an affordable option to hit the water, however, you’ll find that there’s a lot to like with this kayak. As a sit on top kayak, the first glimpse of it makes it look more like a recreational kayak than a fishing kayak. When you see how the broad shoulder of its design and its tracking keel make for easy steering and the fact that it’s got some speed to it, however, you’ll find that there is a lot to love here about this craft. It’s a little heavy at 79 pounds, but the paddle parks and the tank-well that includes some bungee help to take fishing to a new level. This standard tandem fishing kayak feels a bit like the best canoe for fishing when you climb into it at first. You sit way down inside the craft, but this gives it plenty of legroom. There’s not a lot of space for storage, but there are two rod holders that you can take advantage of when you’re out there on the water with a friend. The maximum load range is about 450 pounds, however, so if you’re out there to catch a big one, you might want to leave your friend at home. It’s inflatable, but it does have motor mount fittings and oar holders so you can get to where you need to go. It fills up with air quickly and compresses tightly thanks to the inclusion of two Boston valves on the main chamber, which is nice. There’s also a rub strake and an all around grab line included with the design. Designed to fit three, a good option would be to take two and a cooler that sits in the middle. That way you’ll enjoy a fine day of water recreation – even if you don’t catch anything but a deeper tan. The best fishing kayak is going to have a number of great features to it, yet still be lightweight and portable enough to fit most needs. What are you waiting for? Get your craft, get on the water, and enjoy one of the most peaceful water recreation activities that humanity has ever invented!